While the first trailer released for Avengers: Infinity War left a lot to the imagination, the brand-new second trailer begins to shed some light on the fate of the Avengers. In a recent interview, the Russo Brothers discussed the Marvel Comics influences on the epic movie, noting that they took elements from three distinct storylines. We've already seen one of the major storylines from the comics involving Doctor Strange in the new Infinity War trailer and there are certain other elements that may point directly to certain portions of the story arcs represented in the comics. 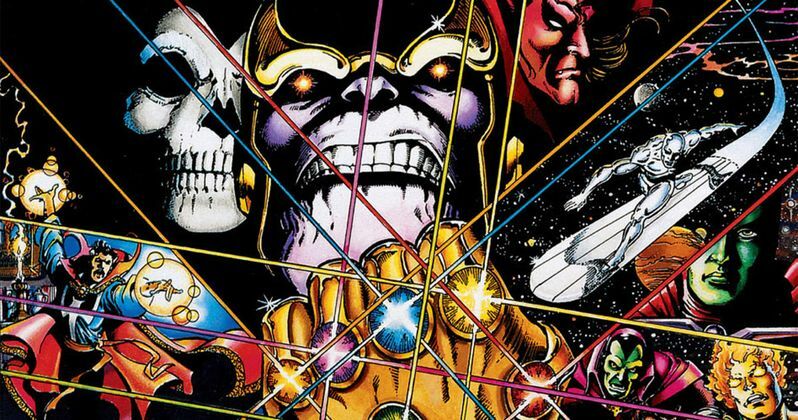 Three Marvel Comics stories have distinct influences on Infinity War, according to the Russo Brothers. The directing duo briefly discussed how these influences directly impacted the movie as well as what they like about them. The first of which is the Jim Starlin's Infinity Gauntlet, which was a 6-issue limited series released at the end of 1991. Joe Russo explains. "Certainly the Starlin book was our jumping-off point. It's a brilliant comic. The ideas behind it are so large, it's what pushed us to go for the scale that we're going for on these movies. Anthony and I love the post-modern comics, so we're also drawing from Infinity, the newer stuff. We're combining it all into, again, what's our favorite stuff, and how do we see elements from each helping our story, and the story that we want to tell." Jonathan Hickman's limited series Infinity was the other major influence that Joe Russo brought up, which came out in 2013. The storyline is hinted at in the new trailer for Infinity War when Ebony Maw is seen torturing Doctor Strange. In Hickman's comic, Thanos and his Black Order are able to use Strange as a double agent while torturing him to lead the Mad Titan to all of the Infinity Stones. It isn't clear if that storyline will be exactly the same as the Infinity comic, but it certainly is an influence that Marvel Comic fans have picked up on. The third influence on Infinity War comes from the Secret Avengers series that ran from 2010 to 2015. Secret Avengers references first started popping up in Captain America: Civil War and those elements will continue on to the upcoming Infinity War. The Secret Avengers are protecting the world on their own terms after the events of Civil War, but they will join in against the epic battle with Thanos for Infinity War. Those are three pretty respected influences to be culling from to form Infinity War and it will be very interesting to see how the Russo Brothers were able to pull from each source to craft something brand-new and fresh. The new trailer definitely has a dark undertone and hints at the death of some of the most famous superheroes in history, which comes from original Marvel Comics storylines that the directors have mixed together. As for what they took from where, we'll have to wait until April 27th. You can check out the rest of the interview with the Russo Brothers over at ComicBook.com.